Fabric signage is seeing major growth in the sign and printing industry. More and more customers are asking for fabric signage. However, sewing can be a large hurdle when trying to finish fabric banners. 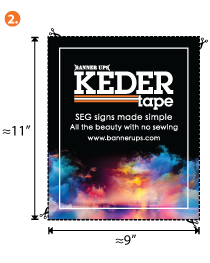 We have created Banner Ups KederTape, a perfect no-sew solution! KederTape will allow you to reach new profitable markets without the hassle of a sewing machine. Simply print your fabric, cut and stick KederTape along the edges. Then tuck the fabric banner into the metal banner frame. Step 1: Assemble then measure the SEG Frame size. Step 2: Ad a 3/8”-1/2” bleed on art area. Print your graphic with bleed. Cut your image from the fabric. 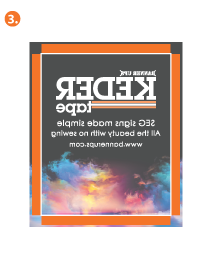 Step 3: On the back align the inner edge of KederTape with the outer edge of the image area. Lightly press KederTape onto fabric. Step 4: Test fit the graphic into the frame. In needed peel back and reposition KederTape to achieve the desired level of tension. Firmly press KederTape onto fabric and cut off any excess fabric. 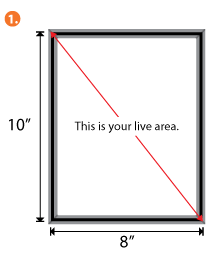 Also, cut the corners at 45-degree angles. Step 5: Tuck the fabric graphic in the SEG Frame. You can use a nail file or scissors to help tuck the Keder into the frame. That’s it! You will end up with a beautiful SEG Sign without touching a sewing machine. 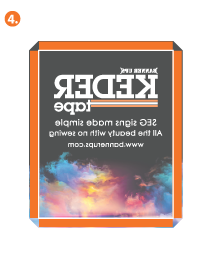 KederTape won the Specialty Graphic Imaging Association’s (SGIA) Product of the Year Award for the laminates, adhesives, films and coatings category (2017). 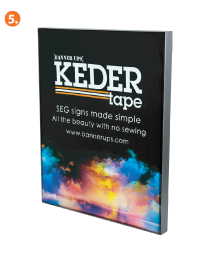 This KederTape adhesive silicone for banner applications makes it possible for anyone to finish fabric SEG signs without sewing equipment. Have any questions? Want to try a sample? Contact us at customerservice@bannerups.com or call 800-869-9601.